Local authorities in the Yemeni Houthi-held capital of Sana'a on Saturday ordered all the city's schools to close cafeterias for ten days. "School buffets in Sana'a are closed as protective measure to limit outbreak of diseases and epidemics including cholera," the Sana'a-based Saba quoted the Houthi-appointed capital governor as saying. Canteens at 980 public and private schools in Sana'a have been asked to chlorine their water reservoirs and to refer their workers to environmental health department for tests and card issuance, Hamoud Obad added. 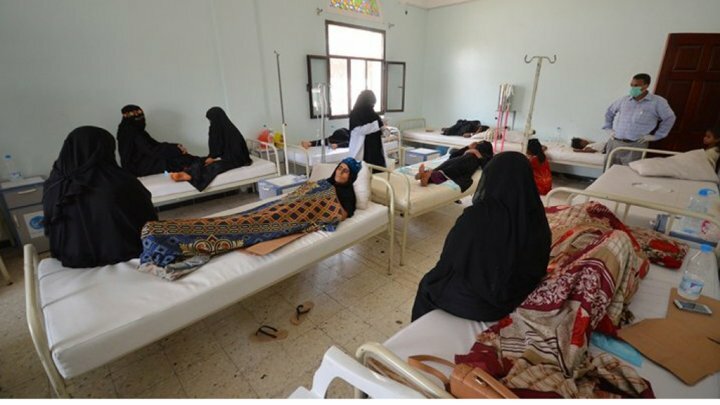 Houthi directives come as cholera cases and deaths have seen sharp increase in the past three months. WHO recent data have revealed an increase in cholera-associated deaths in Yemen to 291 cases since the beginning of the year, 195 of them reported in March only. Since January till 28th of March, nearly 147,927 cases of severe acute watery diarrhea and suspected cholera were reported, according to WHO statistics published Tuesday. Last Thursday, Houthi authorities in Sana'a issued a ban on the entry of all vegetables and other cropsirrigated with sewage water. Measures have been taken to prevent vegetables, grown in farms in the nearby of the manure treatment station, from getting into Sana'a, the capital governor told Saba. Houthis critics accuse the rebels of using the epidemics as political card, to gain funds from international groups, and to connect them with war, charges denied by Houthis.